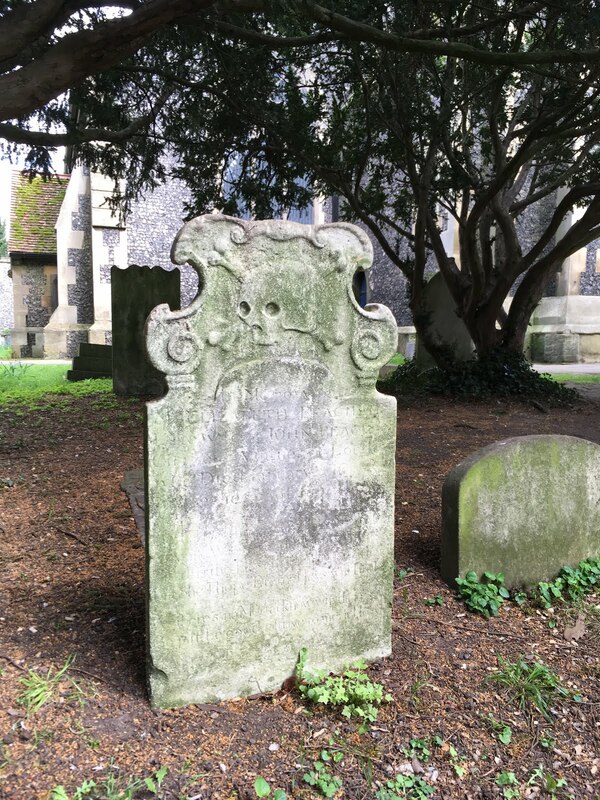 You can find this striking Grade II listed tomb of Elizabeth Beacham just a short distance to the west of the church. The inscription is only partly legible, but the date of death appears to be 1716, which would be consistent with the style of the headstone. The tomb has a striking skull and crossbones design and the upper part of the inscription reads: 'In Memory of / ELIZBETH BEACHAM / Wife of JOHN BEACHAM / CITIZEN & VINTNER OF LONDON / Who died January [1716 In the] 32 year of her age.' The text below is largely illegible, though the lettering is well crafted. The reverse of the headstone is more roughly hewn.